Inventory We are a resale marketplace, not a box office or venue. Ticket prices may exceed face value. This site is not owned by Beacon Theater . 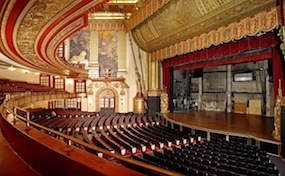 Beacon Theatre New York City built in 1929 is a 2,894 seat venue located right in Manhattan. Even though the Beacon Theatre Box Office is small in size it has played host to some of the best performers on the planet including Eric Clapton, The Allman Brothers Band, Grateful Dead, Bruce Springstein, Rolling Stones, Dave Matthews Band, Bob Marley, Queen, and more. Originally conceived by film producer Herbert Lubin, the Beacon Theater was to be a part of a chain of deluxe movie theaters in New York. The theater was nearly completed when misfortune struck director Lubin and the theater remained unfinished until acquired by Warner Theaters. It ran Warner Brother’s films for the first part of its life and earned the title, Warner’s Beacon Theater. Beacon Theatre recently announced an upcoming $10 million remodeling project. Beacon Theatre Tickets are valued for the intimate design of the small venue with three tiers that offer up close action for every seat in the house. Theatre-NY.com is not currently affiliated with any official site, primary supplier and or box office. We operated completely in the online resale market. Prices on our sites tend to be above face value and will change quickly with demand. Order tickets to all Beacon Theatre New York events quickly online or call our friendly operators at anytime.